The chimpanzee (Pan troglodytes) genome today joined the growing number of species genomes available using the UCSC Genome Browser and Blat server. The DNA donor for this genome assembly, "Clint," is a captive-born West African chimpanzee (Pan troglodytes verus). 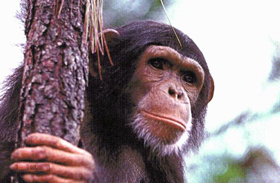 Clint's genome assembly was produced by the Chimpanzee Genome Sequence Consortium. The Genome Bioinformatics Group at UCSC has aligned the chimp genome with the human genome to allow convenient comparison. The genome of our closest living relative differs from ours by only about 1%, corresponding to substitutions in about 40 million DNA base pairs, together with some insertions, deletions, and rearrangements. Our new ability to study the chimp genome sequence has enormous potential to impact our understanding of human disease, human evolution, and human population genetics. Understanding sequence differences between the chimp and human genomes may shed light on the genes involved in major biological differences, such as reproduction, vertebral column structure, and susceptibility to diseases, not to mention speech and language development. Note: Clint died uexpectedly at the age of 24 in January 2005.